Another day for the main contenders for the GC to do battle. It was a great spectacle, both from the point of view of the way the race unfolded and also the beautiful Pyrnees scenery. We have been blessed with some fantastic weather for all the Pyrenean stages and so riding for the peloton and our tour group has been safe and comfortable. Despite the great weather, there were still some guys who had trouble keeping the rubber side down! Poor old Jensie just couldn't stay upright and Ten Dam looked a bit of a mess after his face plant on the road. Stuie did another monster day on the front of the Leopard Trek team to keep the Schleck boys in touch, he's one strong domestique these days and his race craft is important to developing the team's tactics. There were some really serious hills in today's stage, with a HC finish on Plat de Beille, preceded by two Cat 1, two Cat 2 and one Cat 3 climb. Thomas Voeckler is riding out of his skin in his defence of the yellow jersey and Contador, Sanchez and Basso are staying within reach. It was a great win for Vanendert, one of Lotto's climbers, as he was able to slip away from the GC group as he is no threat to the overall result. The battle between the Schlecks and Evans is becoming the real focus and it will make the Alps and the Time Trial in Grenoble very interesting and the race could go right down to the wire. Who knows, after the way Voeckler has ridden in the Pyrenees he could be very hard to toss in the next week. With a two minute lead over his main rivals he could be this year's big surprise and maybe it will be enough of a buffer in the 42 km TT in Grenoble, although he's not a noted Time Trialer. 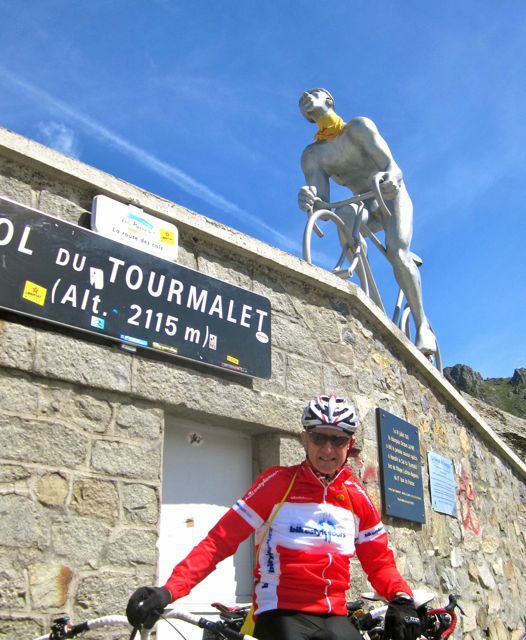 You really can't be cycling in the Pyrenees and not take a trip up Col du Tourmalet. So today, rather than watch a part of the race live, we took a ride from Lourdes up to Tourmalet and back. The round trip is just over 100 km, with a total elevation gain of 2,000 metres and 50 km of climbing. By the time we got home we were all tired little puppies and I think most will have had a quick dinner and then its back to the rooms to pack our bags for our early bus transfer tomorrow. A selection of photos below gives you some idea of how magnificent the area is, particularly when the sun is shining like it was today. Sadly, the forecast for our trip to the alps after the next rest day is looking bleak. 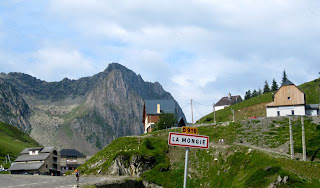 It looks like the race is going to have some pretty nasty rain for a few days and this may limit some of our riding, as descending in the alps is not a pleasant experience....bike brakes don't work so well on steep mountain descents of 15 Km or more. This is a view at about the half way mark of the climb, a great excuse to get off the bike and stretch the legs. The La Mongie ski village is 4 km from the summit of Col du Tourmalet. 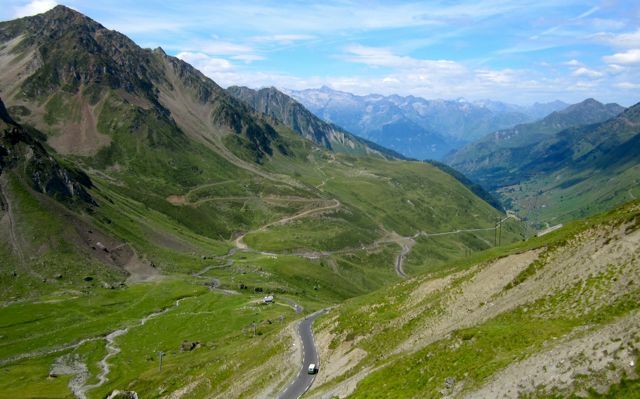 The summit, and the famous shot that every cyclist takes when they finally achieve the goal. 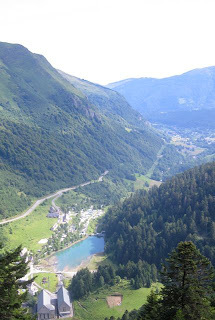 This is the view off the top looking down at the descent you make to Bareges and Luz St Sauveur. It was a very windy day today, so descending could easily have been an issue if you got hit by one of the wind gusts mid corner. As it turned out the wind was OK but the road was littered by loose rocks that had slipped off the scree slopes. 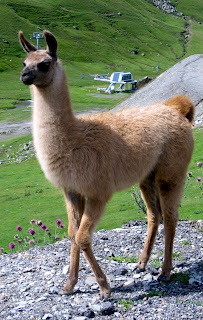 And for the animal feature of the day.....we came across a couple of families of Alpacas at La Mongie and this little fella was pretty cute. Hi Pete, Thomas really liked your shot of the "horse" laughing! 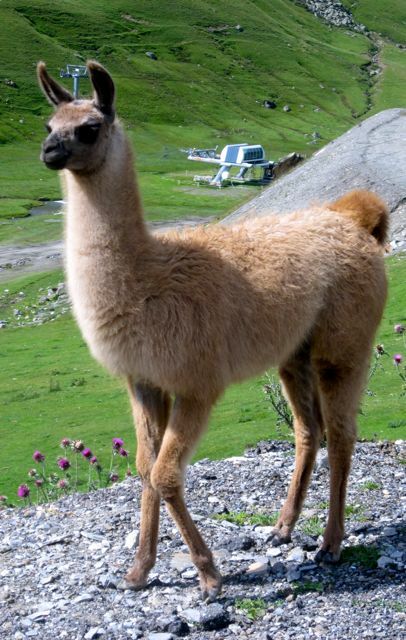 and I am sure he would like the alpaca ... thanks for the update. The scenery must be amazing ... but take it easy on those climbs, and remember to take it all in. Just really hoping Cadel can shave a bit more off his time tonight ... I am starting to get a little stressed about the time difference ... I hope he isn't! It is just sooo difficult to even shave off even a few seconds let alone two minutes!! We wish him luck. Back to work tomorrow ... guess you won't have caught up with the Samoan victory over the wallabies ... but a deserved win even if difficult to watch! We play the springboks next weekend so hope the week's training helps to the wallabies to find some form otherwise the world cup prospects may be a little dim! Hi Pete, body clock on tour time ... how come it doesn't know it is a rest day, Good excuse to play with my new toy ... so much more convenient then my Mac and NO if you are heading to France next year it isn't going. How good is Stu such a fantastic workhorse ... great if he was on Cadel's team though he has a lot more support then in previous years. An all Australian Team ... now that would be good! Hi Pete just had an email from Vicki in the States ... Robyn and her are enjoying following your Blog. Vicki tried to comment but had trouble ... sounds familiar. Stay safe, x Pen. Well Gumbles your commentary is up to par with Phil Liggett and Paul Sherwen! Iam really impressed with standard of your blog. Yes, those crashes were scarey (esp. face plant) and another good leg last night, with great win for Cav. I was impressed at Jens' riding as if he did not have two falls the day before. The wind did not play as much havoc as it could have done.